It's been four months since my last update on my mom's house project. During this time I have been working nonstop and yet it feels like I have nothing to show for it. A lot of the work has been coordination with the survey, soil, structural, mechanical and fire engineers, as well as running back and forth to the city. The design of the house has also gone through minor changes, especially on the exterior but I'll share that next time. Today will be a purely plan-based discussion, focused on zoning and paving design. As I mentioned before, the area of the house is limited to 1200 square feet by the City of Torrance. 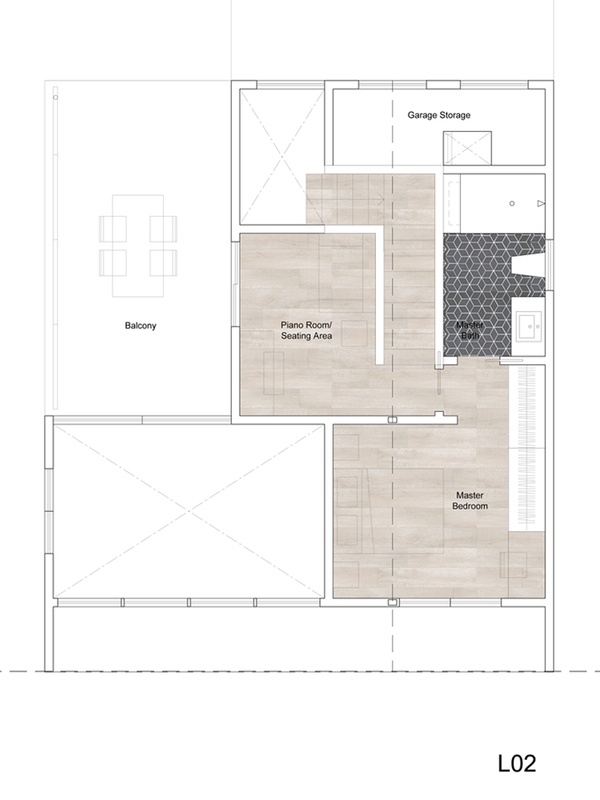 But to maintain a sizable backyard and visibility from the street (the new house will be located behind our existing house, around 200 feet from the street) I made the house two levels so the actual footprint is only 800 square feet which is pretty tiny. 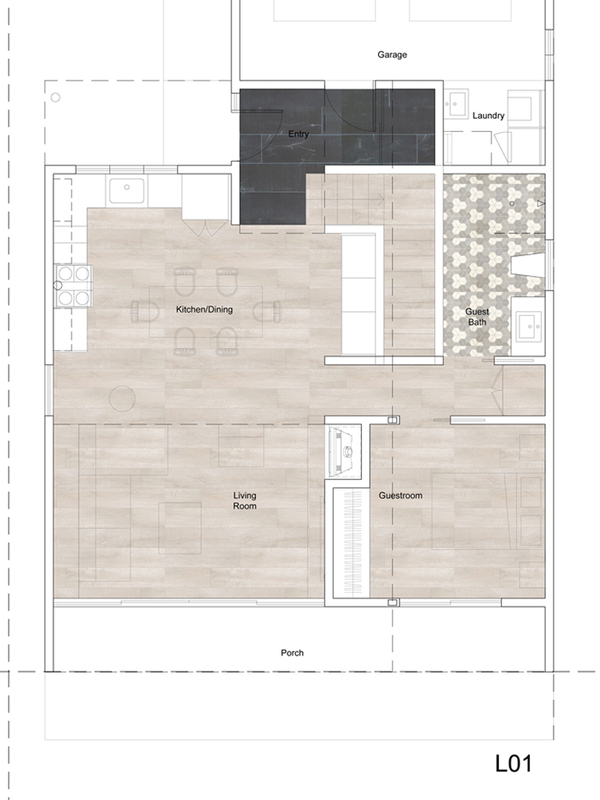 Therefore an open floor plan at the ground floor and proper zoning will help make the space feel more expansive. The white oak floor is consistent throughout to emphasize a singular grand space, the kitchen flows into the living room which opens up into the backyard. Only the entrance and bathroom deviate with their own identity. Paving is just the beginning. I have already started looking into exterior cladding materials, wall and ceiling finishes and light fixtures. It's all fun and games until I punch everything into the budget spreadsheet. And by the way, I'm still behind on the permitting...fml! When my parents moved into their 1-bedroom last year, they downsized a lot of their home furnishings. Since my mom was busy picking and choosing from what they already owned, she did not even imagine buying new pieces. After more than a year of living with what they had, my parents had settled into their place, albeit a little more crowded and cluttered than before. My sister and I (and actually my brother-in-law too) were on a mission to help my mom redecorate the living room. Each of us were dissatisfied with one or more of the pieces. Personally, the lamps were driving me crazy. Ugh to the beading/tasseling! I actually really liked the green chairs, but there just was not enough space for them. 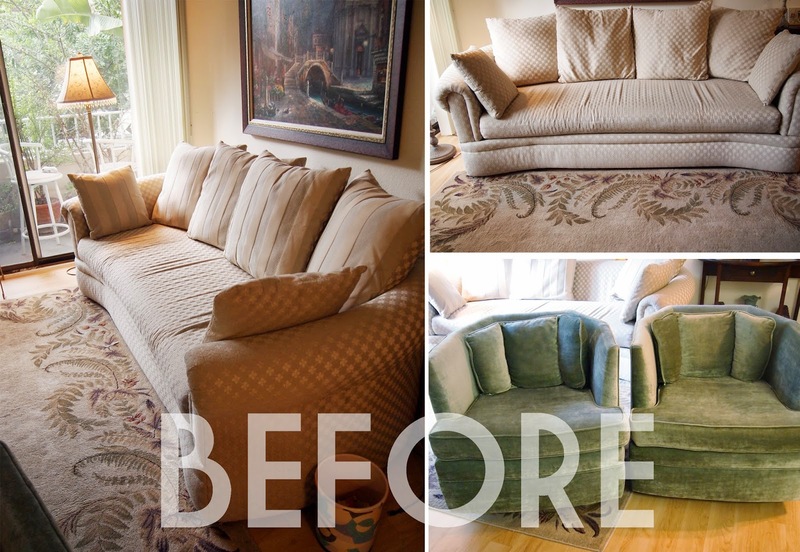 The first swap was the sofa. I spent FOUR grueling hours at the Sofa Company with my mom to pick out a sectional with interesting, textured fabric. 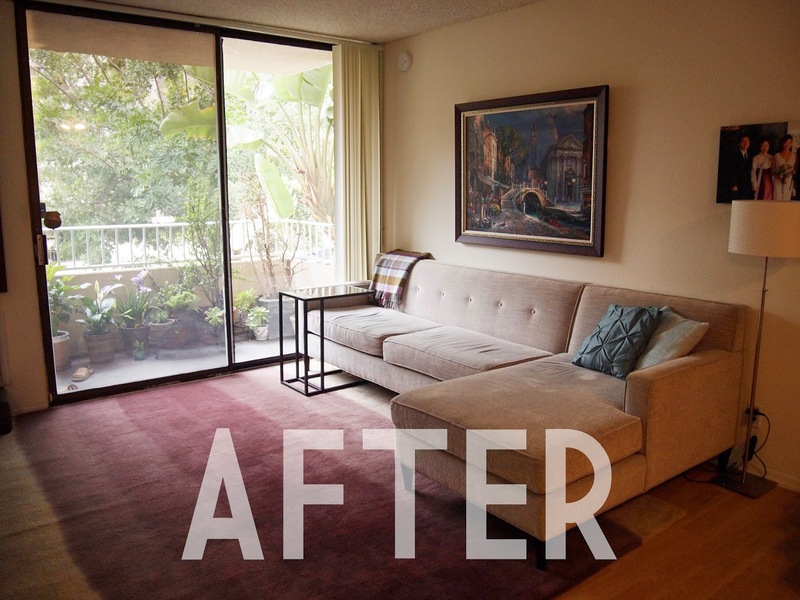 A few weeks later, the sofa was in, and now I am seriously reconsidering my dislike of sectionals. Sectionals are.. genius!!! Also, I am very serious about being awarded some sort of medal for those 4 hours of my life. Next, up was a trip to Ikea to replace the lamp and side table. Though the Alang lamp is by far what I would have chosen, my mom was set on having the lowest floor lamp ever made and of course the $30 price point made the choice final. My mom was on board to switch to the Vittsjo side table because of the way it slides under the sofa and because it was only $25! Seriously, the Vittsjo series is my fave at Ikea - remember our bookcases? The transformation is not complete. I am currently trying to convince my parents to get rid of the painting. Isn't it ugly? Okay, it's not ugly but it does not look like it belongs there. I am thinking either a picture rail (or rails) so they can change out the photos as desired, or a simple but smaller series of art. YAY, I have been waiting for an update! Awesome work so far ladies! So glad we got a YAY out of you!